Sudoku-X puzzles add two extra diagonal regions to regular Sudoku puzzles. Just this small change can often make the puzzles surprisingly more tricky! 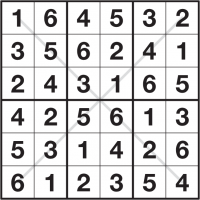 A Sudoku-X puzzle consists of a grid, usually 9x9 but sometimes smaller or larger, where you must place 1 to 9, or 1 to whatever the size of the puzzle is, once each into every row, column, bold-lined rectangle and main diagonal region - these diagonals are always marked to remind you. When you first start a Sudoku-X puzzle some of the squares are already filled-in, and your task is to fill in the rest. Sudoku-X is a logic puzzle, so you solve them via small logical steps rather than simple guesswork. In order to do this it's often helpful to place small pencilmarks into the grid to keep track of possibilities for a square - you can do this on puzzlemix too. Look at the solved puzzle on the left. Notice how not only each row, column and bold-lined rectangle has one each of 1 to 6 in it but also each of the two marked diagonals do too. If this was a 9x9 puzzle then there'd be one each of 1-9 in each of those regions. Sudoku-X puzzles on puzzlemix appear at a wide range of sizes and difficulties. Usually they are 6x6, 8x8 or 9x9, in which case you must place 1-6, 1-8 or 1-9 once each into every row, column and bold-lined rectangle. The bold-lined rectangles are 2x3 for 6x6 puzzles, 4x2 for 8x8 puzzles and they are 3x3 for 9x9 puzzles. Occasionally puzzlemix will feature a larger Sudoku-X 12x12 or even Sudoku-X 16x16 puzzle. In these cases you must place 1 to 9 and A to C, or 1 to 9 and A to G respectively, into each row, column, bold-lined box and marked diagonal. Are you searching for help with Sudoku-X puzzles? Stuck on solving Number Place? Don't know the instructions for Sudoku-X? Need Sudoku-X instructions? Want solving hints and tips for Sudoku-X? Then puzzlemix is the place for you to play Sudoku-X puzzles online. Looking for printed Sudoku-X puzzles? Visit Sudoku Xtra for puzzle magazines and books. Or are you looking for a Sudoku-X puzzle supplier? If so then check out Any Puzzle Media, my puzzle production company.